The scheme was nominated for the award by Wendy Thorogood, Haringey’s smarter travel officer. 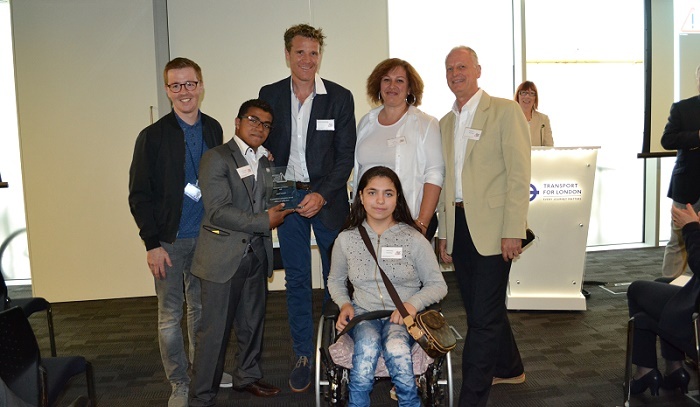 The award was presented to Richard Tharp and pupils from the school by James Cracknell, London Road Safety Council president, at the organisation’s 2016 AGM on 22 July. The London Road Safety Award is designed to highlight and reward innovation and good practice in road safety education in London. Introduced in 2003 as the Laurie Bunn Award, in memory of a past LRSC chairman, the award was renamed earlier this year. The Vale School’s ‘Travelators’ scheme is designed to help young people with special needs gain independence. Students decided that after being brought to and from school for many years, they wanted to show their families they were capable of independent travel and aware of the dangers and pitfalls. Under the guidance of TfL and teacher Richard Tharp, the group created an information film (above) showing the problems encountered by young adults with special needs. Brent Council was named runner-up for its SEN road safety awareness project which has been successfully piloted at Phoenix Arch School for young people who are autistic or have learning or behavioural difficulties. The Brent scheme is designed to increase confidence among SEN pupils aged 7-11 years while out walking or using public transport. Following the success of the pilot, a second stage is being developed which will include travelling on public transport, using bus timetables and route planning. 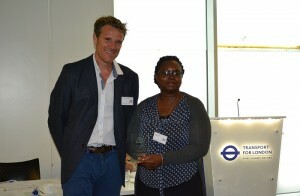 The award was presented to Valerie Springer from Brent’s road safety team.